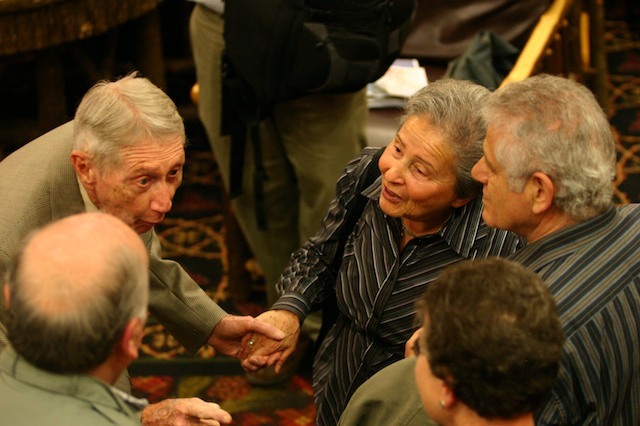 US Army tank commander and liberator Carrol Walsh is reunited with the Holocaust survivors he helped to freedom 64 years earlier; Ariela Rojek, Paul Arato, Elisabeth Seaman, Fred Spiegel. Sept 23, 2009. To my survivor friend who recently got online and now checks her computer everyday, to see the website, because it “makes me happy”. It makes me happy to know how much this means to you and the others, even though I’m not updating it every day! I love to hear from you, sometimes it comes when I need to hear it. Best wishes for a happy and healthy new year! To all our soldiers too!